RADNOR, PA – January 20, 2015 – Community Energy, Inc. today announced completion of 500 kilowatts of community solar generation in Antonito, Colorado. Forty-four commercial and residential customers in the town have subscribed to receive power from the project under a long-term service agreement that allows customers to receive a 10 percent discount on their electricity costs. 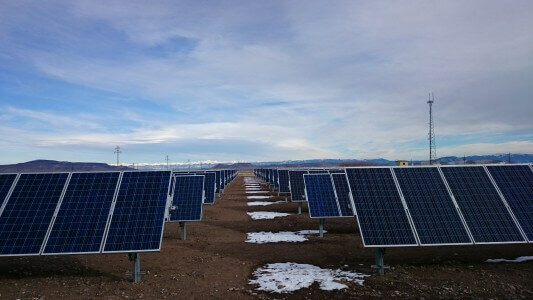 As a community solar project under the Colorado Community Solar Gardens Act, subscribers will receive a credit for solar generation from the project directly on their utility electric bill. The Town of Antonito is among the lead customers taking power under the solar project. Key Equipment Finance, a division of KeyBank, provided financing in the form of a project loan. Sited on 3.5 acres of previously unused land, Antonito Solar was installed by Namasté Solar Electric using ReneSola solar modules and ATI single-axis trackers. With this latest tracking technology the solar modules follow the sun each day as it tracks from east to west, allowing the project to generate 1,114,000 kilowatt hours of fuel-free, solar-generated electricity each year, about enough to power over 100 Coloradoan homes. Since its inception in 1999, Community Energy has developed more than 1000 megawatts of solar and wind power. With long experience in utility energy marketing, the Company leads the markets in new financing structures, development expertise, and delivery of projects in new markets under new policies, all within its mission to accelerate the deployment of renewable energy at scale. Headquartered in Radnor, Pennsylvania and offices in Boulder, Colorado, Community Energy has a strong presence in both eastern and western renewable energy markets. For more information about Community Energy, please visit www.communityenergysolar.com. Key Equipment Finance has been in the equipment finance business for 41 years and is one of the largest bank-based equipment finance providers in the U.S. The company provides tailored equipment lease and finance solutions for commercial clients and government entities. Through its manufacturer and vendor alliances unit, equipment finance programs are developed for manufacturers, distributors and resellers. Key Equipment Finance’s specialty finance group includes a lease capital markets team to support corporations looking to optimize risk and revenue, and a lender finance team, which provides structured facilities to various sectors of the specialty finance market. Headquartered outside Denver, Colorado, Key Equipment Finance manages $9.1 billion in assets and originates $4.3 billion of equipment financing annually. For more information, visit http://www.keyequipmentfinance.com. KeyCorp (NYSE: KEY) was organized more than 160 years ago and is headquartered in Cleveland, Ohio. One of the nation’s largest bank-based financial services companies, Key has assets of approximately $89.8 billion at Sept. 30, 2014. Key provides deposit, lending, cash management and investment services to individuals, small and medium-sized businesses under the name of KeyBank N.A. Key also provides a broad range of sophisticated corporate and investment banking products, such as merger and acquisition advice, public and private debt and equity, syndications and derivatives to middle market companies in selected industries throughout the United States under the KeyBanc Capital Markets trade name. For more information, visit https://www.key.com/. KeyBank is Member FDIC.